Do you need to have your own defib? Previously, they would’ve accepted a written agreement with another provider that equipment could be borrowed. As long as it could be retrieved and used within the 3 minute guideline as per Resuscitation Council Guidelines. 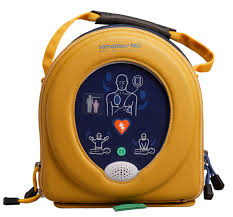 However, this has changed and they are expecting practices to have their own AED and for staff to know how to use it. There will be a little leeway for practices that don’t currently have one, but you will need to purchase one in the next few months. If you don’t currently have one and would like some help please get in touch. Do you need paediatric pads? The short answer is no! The longer answer is that you must follow Resuscitation Council Guidelines and manufacturer guidelines. These state that you can use adult pads on a child but they will need to be placed front and back on a child under 8 and not used on a child under 1 year. Very young children do not usually need defibrillating and the focus should be on basic life support and getting your help. What is the impact for your CPR training? It’s important because of this that your trainer shows you how to use your defib and discusses the requirements for children. All staff must be aware of how to use the defib as this will be assessed as part of the ‘Safety’ audit when the CQC visit. If your trainer isn’t going through this with you please ask them or feel free to contact me.